SHEED, MESEN and Melbourne’s RW34. A Look Back at Virgin Australia’s Boeing 777 Flight Path Incident. It’s been a little over 12 months now since the ATSB were informed of an incident involving a Virgin Australia Boeing 777 and an unstable approach to Runway 34 at Melbourne (YMML, MEL). Given the impending update from the ATSB, now is a good chance to reflect on the incident before the final report is published. This article seeks to uncover a means in which to mitigate occurrences of similar unstabilised approaches elsewhere, and we’ll also compare the procedure as flown on the Boeing 777 to that of the Boeing 737 (for which similar incidents are a rarity). During the STAR, the aircraft was fully configured for the approach with the landing gear down and the landing flaps set. The autopilot was engaged and configured for both vertical and lateral navigation modes.2 At about 0810 Eastern Standard Time, after passing waypoint SHEED, the final waypoint in the STAR, the autopilot increased the rate of descent from about 700 feet per minute (fpm) to about 1,500 fpm. This was a greater rate than the crew were expecting. They discussed the anomalous descent and, expecting it to stabilise at the anticipated rate, they decided to monitor the aircraft’s rate of descent further. Noting that the captain was concentrating on the information presented on the aircraft’s instruments, the first officer turned his attention outside of the cockpit to visually monitor the approach to the runway, which he had sighted to the right of the aircraft. The first officer noted that the approach to the runway visually appeared to be too low and alerted the captain, who agreed and attempted to reduce the rate of descent using the vertical speed mode of the automatic flight control system. After realising that this would not be effective, the captain disconnected the autopilot and took manual control of the aircraft. The aircraft was levelled off at about 700 ft above mean sea level (AMSL), or about 500 ft above ground level, and turned to the right to align with the runway. The aircraft was flown level until the 3° approach glideslope was intercepted using the runway 34 Precision Approach Path Indicator (PAPI) and a normal approach and landing carried out. While it is important to understand that the approach is not difficult, there are some subtle traps for those that don’t fly the approach very often. The same traps apply on numerous arrivals globally so the threats discussed in this article could easy be translated to other airports and approaches. To understand how the 777 came to have a high rate of descent, it’s important to have an understanding of the arrival into Melbourne and the visual approach segment. Since this incident occurred, AirServices have added the new waypoint MESEN to the LIZZI STAR (discussed later). However, a look back at the STAR that was in place at the time of the incident is as follows. The SHEED waypoint constraint (2500 or above) exists because of the proximity of Essendon Airport from Tullamarine (about 8 kilometres south-east or 4 miles from the runway 34 threshold). Aircraft are sequenced over the top of SHEED (YMEN threshold RW26) before conducting a visual approach to RW34. RX-34 (or RX01 in a 737) – User created waypoint to align the aircraft with the runway centreline (for a 3° slope, 318 feet per nautical mile applies… or 300 feet if we err on the side of memory-friendly caution). RW34 – Runway 34 threshold (threshold of 330 feet + 50 foot crossing height) – 380 feet. Applying these three waypoints, there are now three components of the approach that are flown from SHEED through to RW34. TURN: The turn from base to final. Radius of turn is roughly 0.87nm in our example (22° AOB and 155 TAS); this equates to roughly 1.4 track miles. The problem with what we’ve described thus far is that we require a myriad of use-defined waypoints to be created for the purpose of using automation. This is a STAR (STandard Arival Route) and not an approach. The STAR will normally (and ideally) terminate with an approach. Not in this case. On descent and approaching SHEED (Essendon) on base for RW34. It could be argued that the visual segment should be flown manually with the autopilot and flight directors off from SHEED, but that’s not the point. If automation were to be used, as would be expected in a heavy jet at the tail end of a long haul flight half way across the world, one would expect that the STAR (and approach) would facilitate a stable and safe arrival. We would also expect the fatigued crew to use as much automation as is available to them as a means of managing risk. The design of Melbourne’s RW34 visual approach is poor and does not provide for a Constant Descent Angle (CDA) to the runway. A CDA – or Constant Descent Final Approach (CDFA) – is considered to be at the cornerstone of any approach and stable approach design. Since it’s important to establish ourselves on a 3° slope on our final approach segment, it means that we have to have a higher angle of descent from SHEED to the point from which we commence our final approach. Although the distance from SHEED to the extended centreline waypoint (RX-34 in the B777) is shown as 2.9 nautical miles, the distance flown on base is compromised by the turn (the radius of approximately 0.87 at 155 TAS and 22 AOB as described in our photographs translates to track miles of approximately 1.4 miles, so nearly a mile is lost). Therefore the angle flown on base (prior to our turn onto final) translates to roughly 4.4° if we chose to meet the 3° profile on final (I’ve used a ground distance of 2.6nm rather than 2.9nm to conservatively account for track miles lost in the turn and the delay in achieving the desired ROD). An easterly quartering tailwind on base will severely compromise on descent performance requiring a higher rate of descent to ensure the profile is achieved. If a constant path were flown from SHEED to runway 34, the angle of the approach would be in excess of 3.5 degrees (give or take – the turn onto final can vary this figure). To ensure a stable approach is flown (that is compliant with company stabilised approach criteria) the segment between SHEED and the waypoint that aligns the aircraft with the RW34 centerline requires a 4.4° angle of descent be flown on base with the associated high rate of descent. This technique provides a 3° slope on final. Between 1100fpm and 1250fpm to maintain path, still 40 feet high on this approach. The above photograph shows an aircraft (in this case, a Boeing 737) past SHEED and just before the turn onto final. The final segment commences at around 2.6 or 2.7 miles from the threshold at approximately 1270 feet (or around 800 feet above the threshold crossing height of 380 feet). The ROD in the photograph shows 1150 feet per minute although it isn’t uncommon to see a descent rate in excess of 1200 feet per minute until the turn. Because of the high rate of descent, and since the it’s a requirement (for most airlines, including Virgin) to maintain a rate of descent below 1000 feet per minute below 1000 above ground level, the approach calls for a unique brand of trickery in ensuring that a stable approach is maintained. In a Boeing 777, particularly when heavy, higher approach speeds could be expected with an even higher rate of descent. In an ideal environment, every approach would be flown utilising the RNAV, (offset) VOR or RNP approach that provides for a 3° profile. That said, in most circumstances, Melbourne ATC prefer the Visual approaches and aircraft usually fly it without incident – particularly local crews that are more than aware of the subtle risks associated with the path. What Went Wrong with Virgin Australia’s Boeing 777? 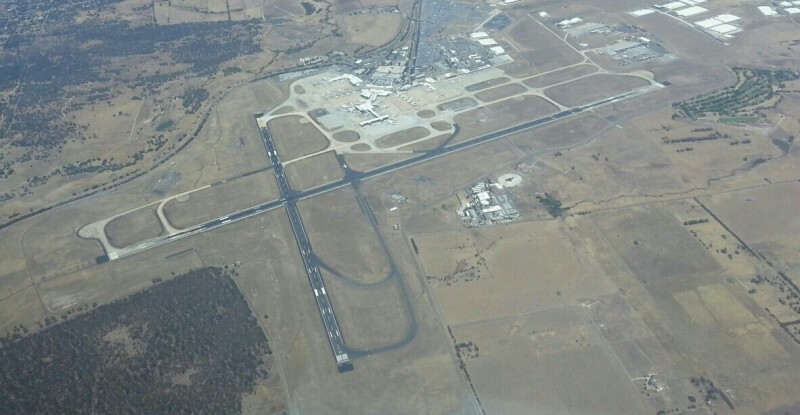 Having discussed the issues associated with the visual path to runway 34 at Melbourne, the approach angle had litte to do with Virgin’s incident (but it did set an expectation for a high rate of descent for the initial part of the approach). Rather, it was due to the user created waypoints that draw the lateral visual segment of the approach. The following sequence is used in the Boeing 777 FMC to build the visual approach to RW34 via SHEED. Prior to MESEN, the Boeing 777 crew would also have to manufacture a RX-34 runway extension point, adding further complexity to the programming of the box with an increased the likelihood for data entry errors. The relevant image is the last one and, more importantly, the three last waypoints. Even if you’re not a pilot and don’t have a clear mental picture of how the approach was programmed, the following two images seated side-by-side illustrates how the error was made (it’s the image on the right that was incorrect). The first line – SHEED 160/2500 (top right of the image) – will command the aotoflight system to drive the aircraft over SHEED at 2500 feet and 160 knots. The second line shows MESEN (a waypoint that didn’t exist at the time of the incident, so assume it’s user created). At MESEN (the point aligned with the runway centreline), the aircraft should be 1270 feet (hard-coded) and the speed, again, 160 knots (in this case the waypoint is 3 nautical miles from the threshold). The last line shows the aircraft at 145 knots at 380 feet over the RW34 threshold (the 145 knots is the flap 30 approach speed and 380 feet refers to the RW34 threshold crossing height (330+50)). The FMC altitude requirement at MESEN (the user defined waypoint at the time of the incident) was hard coded as 380 feet. The FMC at this point was commanding an altitude of 380 feet at a point on the approach when the crew were aiming under normal circumstances to be at 1270 feet. The user created waypoint was commanding a height nearly 900 feet lower than what was required. The data entry error was picked up on early on in the approach, but not before the aircraft had descended well below the required flight path. Flight Aware shows the aircraft reaching a rate of descent of 1500 feet per minute although it is suggested that it was higher. In the time it took for crew to have a brief discussion about the descent rate (expecting it to stablise), the aircraft had flown well below the desired flight path. The crew levelled out at 700 feet above mean sea level (AMSL), or about 500 feet above ground level – nearly 600 feet below the desired path, and well outside published company stabilisation criteria. None of the three monitoring pilots called “unstable” or called for a go-around. After this incident, and other concerns expressed by crew, Virgin’s Boeing 777 standards management now requires that crew fly the RW34 RNAV GNSS which provides for a 3° approach path. The aircraft was levelled off at about 700 ft above mean sea level (AMSL), or about 500 ft above ground level, and turned to the right to align with the runway. The incorrect FMC programming is a mistake not that dissimilar to low risk errors made virtually every day at every airport around the globe. In almost all circumstances, a correction is quickly applied without any consideration or thought and a normal approach and landing is continued. What concerned me about the incident in Melbourne – which wasn’t asked of the ATSB in their interim summary nor discussed by mainstream media – is why a missed approach wasn’t conducted. &period; Continuing an unstabilised approach is a causal factor in over 40% of all approach and landing accidents. &period; Approximately 70 % of rushed and unstable approaches involve an incorrect management of the descent-and-approach profile and/or energy level (i.e., being slow and/or low, being fast and/or high). &period; 56% of commercial jet airplane accidents occur during the approach and landing phases of flight and account for 44 percent of all fatalities worldwide. The approach and landing typically accounts for 16% of the total flight time. The stable approach criteria for Virgin Australia’s long haul operation is 1000 feet… but here they were, nearly 600 feet low on an approach (below 1000 feet), and an unstable call wasn’t called for by any crew member. The failure to execute a missed approach should likely be a significant focus of the ATSB investigation. As previously mentioned, the requirement of an approach to provide for a constant 3° profile (or any defined profile) to the crossing height of the runway is considered to be one of the most crucial elements to any good approach design. Boeing, Airbus, Flight Safety, the FAA and other regulator bodies have all published their own guidelines and literature that reinforces the need to meet stable criteria for an approach. In most of their publications there’s one element that isn’t clearly defined – the flight path angle of 3° (in the attached FSF ALAR elements of a stabilised approach image, they only state that “[t]he aircraft is on the correct flight path”). Consistent with FSF recommendations, any approach “requiring a deviation from the elements of a stabilised approach require a special briefing”. This would include the steeper path and the possibility of a higher descent rate. Whenever an approach will vacate stabilised criteria by design, specific mention should be made in the initial approach briefing, reinforced as an operational threat. A Constant Descent Angle can be maintained on an approach if a higher angle of descent and rate of descent is accepted. However what might be accepted in a straight in visual approach might be avoided on a visual approach that requires a turn. That said, an aircraft should still be considered stable on base if the correct configuration and expected path is achieved. The recommendation by Boeing, Airbus and the Flight Safety Foundation is that “… the implementation of certified constant-angle procedures for non-precision approaches should be expedited globally”. Again, of course, the LIZZI arrival into Melbourne isn’t an arrival – it’s a visual approach. Still, a STAR into a visual segment shouldn’t position crews such that a stable approach is compromised. In the aftermath of the this incident and a number of others involving International carriers, AirServices Australia introduced a waypoint MESEN into the approach. MESEN is set back about 2.7 nautical miles from the threshold and on the runway centreline, consistent with the user defined waypoint most pilots would create. MESEN provides a lateral or LNAV path to align with the centreline but it won’t provide vertical guidance. Pilots will still have to alter the crossing height at MESEN to ensure that it positions them for a stable 3° path on final. As a means of actually seeing the visual arrival flown, here’s an example of how the approach is flown in a Boeing 737. On receipt of a STAR, the crew will select the arrival from the FMC database. The B737 FMC permits a flight path angle to be drawn from the runway threshold (crossing height) to either an extended path or to the previous waypoint defined on the approach. In this case, we’ll select the LIZZI 9 Victor arrival for RW34. We have to define the FPA (or Flight Path Angle) as 3°. Since waypoint MESEN exists we no longer have to enter a RWY EXT (RunWaY EXTension). The approach creates a 3° slope to the RW34 runway crossing height, with a MESEN crossing altitude of 1266 feet. Note that without defining the 3° slope back from RW34, the vertical profile has us crossing MESEN at 1455 feet, nearly 200 feet higher than the previous case where the slope was provided. It’s a trap that can add to the likelihood of an unstable approach. Also, the FMC predicates its VNAV crossing height at 404 feet – 24 feet higher than the correct crossing height of 380 feet. This can be corrected by manually hard-coding an altitude of /380 on the legs page. The following two images show the aircraft approaching SHEED. To assist with maintaining a stable approach it’s normal to have the aircraft configured with landing flap (and checklist completed) before commencing the visual approach overhead SHEED. It can be particularly challenging ensuring the aircraft maintains a stable descent with a tailwind at this point since a lower nose attitude (and higher rate of descent) is required to maintain the nearly 4.5° path. At higher weights, a higher rate of descent is the result leaving little room for profile errors. The image on the left shows Melbourne Airport and the RW34 threshold just prior to the turn. We’re looking for roughly 1250 feet or so at the point we roll wings level while we arrest the rate of descent to below 1000 feet per minute (assuming a higher rate was previously required). Since it’s a visual approach, it’s normal to fly the approach with visual reference to the field, using automation only to relieve workload. Managing the high(ish) ROD on base as the aircraft turns onto final for a stable approach below 1000 feet. The Boeing 737 is fitted with a Visual Situation Display (or VSD) that enhances situational awareness. It provides a magenta profile line drawn in the Navigation Display fed from FMC VNAV data. It is not part of the Boeing 777 avionics package. While many simply use the runway as a reference point, it’s not uncommon to also use the trend indicator to align the aircraft with the centreline. This incident doesn’t contribute to the argument of automation dependency. Rather, it illustrates the sound and expected usage by using the highest level of automation that is available to the crew. While the high rate of descent was transient and unexpected, the crew disengaged the autopilot and manually flew the aircraft – fully aware at that point that the automation had failed them. They were quick to identify the error in the FMC programming and continued the landing without incident. Some manufactures prohibit visual approaches using the FMS navigation source for guidance. The Embraer is one such example. If a visual approach is depicted on the chart, it be flown as such. Data entry errors can be minor (as was the case here) or potentially far more catastrophic . The most significant threat identified by way of this incident is that the data entry errors could occur in the first place. How did it happen and what procedures can be put in place to mitigate the likelihood of a reoccurrence? Ken’s looked at detection and correction of procedural errors on the flight deck and we’ll revisit the issue another time, despite playing a significant role in this event. The ATSB has produced a data entry error video (below), and they’ve produced a good publication, “Take-off performance calculation and entry errors: A global perspective ” in the aftermath of the Emirates A340 overrun at Melbourne Airport – well worth reading (download here). We’ll address these publications another time. The FMC waypoints and vertical altitude requirements were not correctly crosschecked by the crew. The Boeing 777’s FMC is restrictive when selecting visual arrivals. It doesn’t provide VNAV ‘enabled’ runway thresholds or the feature to extend a path from the crossing height. It’s possible that there wasn’t suitable awareness among crew on how the user created waypoints should be used to ensure a correct 3° path. After a 14 hour flight, it’s highly likely that all crew were fatigued and far more likely to make errors. The long haul crew are, likely any global long-haul crew, on the verge of being perpetually uncurrent. It may have been months since any of them had flown an approach to Melbourne’s RW34. Although automation shouldn’t be discouraged, it is expected that, consisted with any visual approach, crew should not be distracted from monitoring external references. The RW34 Victor arrival sets an early expectation for an initial high rate of descent. The crew made attempts to unsuccessfully resolve the automated high rate of descent with another form of automation (V/S, Vertical Speed) when disconnecting automatics might have been more prudent. The Boeing 777 FMC does not facilitate easy creation of waypoints off the runway threshold. The visual approach via SHEED (with the 2500 feet altitude requirement) is poorly designed and does not provide a 3° descent profile by default. No mention is made on the chart. No VSD is available for the Boeing 777. If it were installed, the error in the vertical profile would be easily identified. No call for a go-around (from any of the three monitoring crew) was made when the aircraft vacated company stabilised approach criteria (well below two dots low on the PAPI). ATSB Final Report – Descent below approach path involving a Boeing 777, VH-VPF, near Melbourne Airport, Victoria on 15 August 2013. Download link will be made available when the report is published. You’ve written the 2009 incident as a 777, not A345. A little ironic considering the article, how easy it is to make these errors which can have terrible consequences and I’m sure you’ve proof read this article plenty of times before publishing. Shows how hard they are to catch. I’m told that our post had an impact upon the ATSB investigation. Final ATSB report now not due until March, 2015.